For the members of today’s military no personal sacrifice goes unpunished. Deployments, frequent relocations and a steady paycheck make our service men and women prime targets for high interest loans, identity theft, credit reporting errors, automobile fraud and countless other unscrupulous scams. 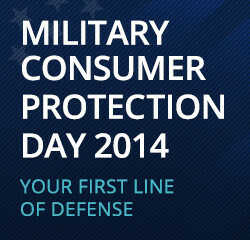 In an effort to promote awareness of consumer issues facing our men and women in uniform, the Department of Defense, the Federal Trade Commission, the Consumer Financial Protection Bureau’s Office of Servicemember Affairs, and Military Saves have joined to sponsor Military Consumer — a campaign to empower military and veteran communities with tips and tools to be informed consumers. Wednesday, July 16th will be the second annual Military Consumer Protection Day. Take some time to check out the wealth of tips and information specifically tailored for the military community and veterans from federal and state government and non-profit partner organizations. The Law Office of Grant D. Gilmore is dedicating to protecting the rights of all Utah’s military consumers. If you or someone you know is a member of the military who has been victimized by predatory business practices contact me today.